SWD-H-4TPS-4TX is a ruggedized DIN Rail Ethernet that delivers four 802.3ah POE ports to feed Ethernet equipment with a 15 W power budget. 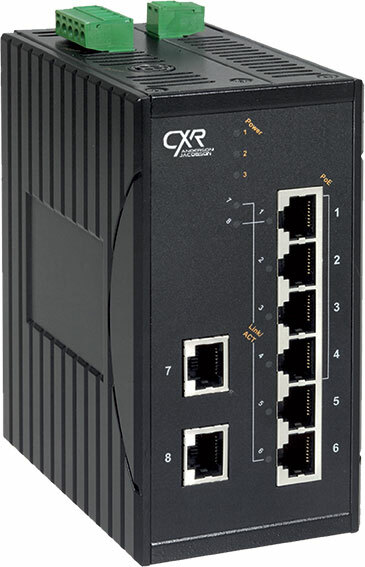 It provides a total of 8 Fast Ethernet ports with options for one or two 100FX optical interfaces. SWD-H-4TPS-4TX is qualified for rolling transport system with compliance to the EMark E4 standard. SWD-H-4TPS-4TX is a high quality non-manageable automatic switch. It is very easy to install and operate in any application that does not require Ethernet access device management. It comes as a compact DIN rail format product, 65 mm wide. SWD-H-4TPS-4TX is a high reliability fan-less industrial design aimed at serving the most stringent industry requirements.